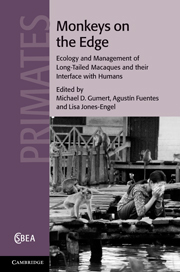 I am not qualified to review this book — it is written by and intended for people with a much more academic interest in long-tailed macaques than me. What I can say, though, is that it could not have been published at a more opportune time as far as the Phana Macaque Project goes, since it deals with all the aspects of living alongside these monkeys which are of interest and concern to us in Phana. It also points to problems we have not yet come up against; and most important of all, it has recommendations for solving some of the problems that we have already encountered or seen the possibility of emerging in the future. I will include further quotes from the book in future posts. This entry was posted in Long-tailed Macaques, Macaca Fascicularis, monkey forest, Monkeys and tagged Long-tailed Macaques, Macaques, Thai monkeys. Bookmark the permalink.